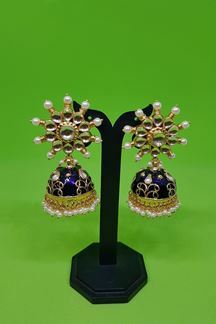 Wear a graceful appeal wearing this designer gold plated necklace set featuring gold beads worked necklace and artificial pearls and gold plated pendant motif along with matching earrings for a gleeful appeal! Note: Please note that the Free Shipping offer doesn’t apply to any products purchased under the Accessories section. Shipping charges will apply. Shipping charges will be waived off only if the product is bought along with any product under the following categories – Sarees/Suit/Gown/Lehengas/Kurtis.